Super soup is a special formula designed specifically for the clone engine. No other oil manufacturers has paid attention to this Chinese engine like the crew from super soup has. From the viscosity, anti friction additives, flash point and viscosity index; every little detailed in this formula was thought specifically for the clone engine! It's a formula by clone racers, engine builders oil chemistry and lubrication consultants for the clone special and specific needs. What is so special and specific about the clones? Being mass produced there's a lot of variations in the castings, quality control is not the best like in America, clearances are always questionable and the metallurgy is nothing compared to the stout built Briggs or Honda engines just to name a few. Fear of your side cover loosening up and emptying your crankcase while having fun? That's the condition that started these specific formulas.That means that if a product can improve the clone reliability the other engines similar in design will benefit from that product because the clone is the ultimate test mule, if it survived the clone, it can survive anything! The rest is a walk in the park! What is super soup? In a real good soup you need the right ingredients mixed together by a very good chef right? Not all Chinese food taste the same, but all the ingredients are the same! So what makes the difference is the chef and the way he prepares and seasons the food. Also every good chef has a secret ingredient or a family kept secret recipe! 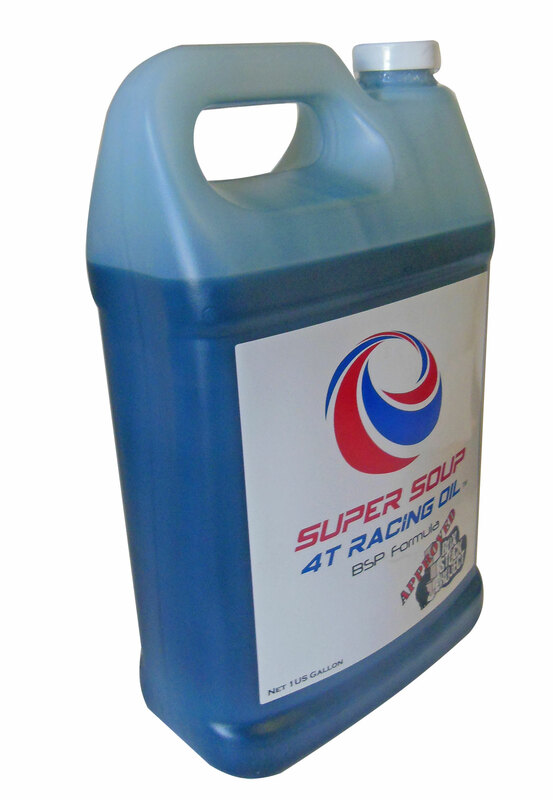 Enter Super Soup 4T Racing Oil,For all non-filtered splash system air cooled high RPM 4 stroke engines. 100% synthetic, High shear oil with an outstanding additive package that does not rely on conventional high-Zinc to protect the engine. The BSP Formula chemestry creates a ball bearing effect to minimize friction by treating the mating surfaces and prevent metal to metal contact, and can withstand extreme pressure under the most severe conditions ensuring a cooler running engine. A very high viscosity index to ensure a smooth and slow transition from a cold start to operating temperature maintaining oil film strength. But why is a high viscosity index important for the clone? Clones are known to run great while cold but once they are hot clearances change specially on the rockers and this affects cam duration and lift negatively, and it starts to loose power. Don't need to change oil every race or weekend because this formula is deigned to last in your crankcase resulting in more savings. Note: Due to their lubricity, these lubricants will prevent the piston rings from sealing. Break-in engine with regular oil before using this product. SHAKE WELL before using. Remember, this oil is formulated for the clones & Briggs exclusively where no filter, no oil pump and no radiators are used!